April was a washout for training, so I am going to have to get in shape in one month. I rode yesterday and felt pretty good afterwards, but I was not pushing myself. Today, I saw the sun shining and felt like riding so I put on my riding stuff and got on my bike and rode. I do short workouts during the week that last around 45 minutes, but I push myself the whole time. Sunshine, humidity and gravity make the muscles hurt, but the big pumper in my chest just keeps right on working. My legs get tired, but the pump just keeps pumping. Sunday, if the weather is cooperating, I will ride downtown to the parks along the Ohio River and then back to Northside. Tomorrow I will rest and give my old muscles a chance to recover a bit before I ride on Friday. 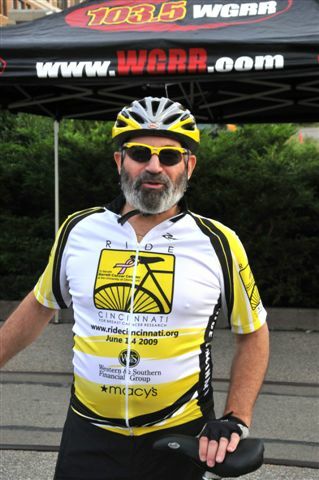 If you would like to find out more about RIDE CINCINNATI 2011, just Google it. This ride raises money to support breast cancer research here in Cincinnati. I believe this is the 5th year of the ride and I am looking forward to riding this year. I think they should have a "Ski Cincinnati" ride. Lou, That is a great idea. Perhaps someday they might do that. Cloudia, Thank you for the compliment. That is an old picture, but I haven't changed too much. Tell me, what do all those marks you put after your comment mean? I am curious what they mean.